Reclassifying WWE’s 215 contracted performers would cost the company, by an aggressive estimate, about $28.5 million in annual added expenses. That’s a price WWE is more than profitable enough to cover. WWE reported $99.6 million in net income for the full year of 2018. That was an all-time record for the company, even when adjusted for inflation. 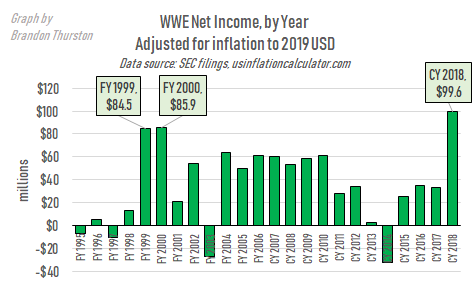 That’s more net income than years of WWE’s height in popularity during 1999 and 2000. Other profit metrics for 2018 were $114.5 million in operating income and $178.9 million in adjusted OIBDA (operating income before depreciation and amortization). Upcoming increases in TV rights fees related to flagship programs Raw and Smackdown will likely break financial records for consecutive years to come. New deals with the USA Network and Fox Sports basically guarantee escalating payments through 2024. 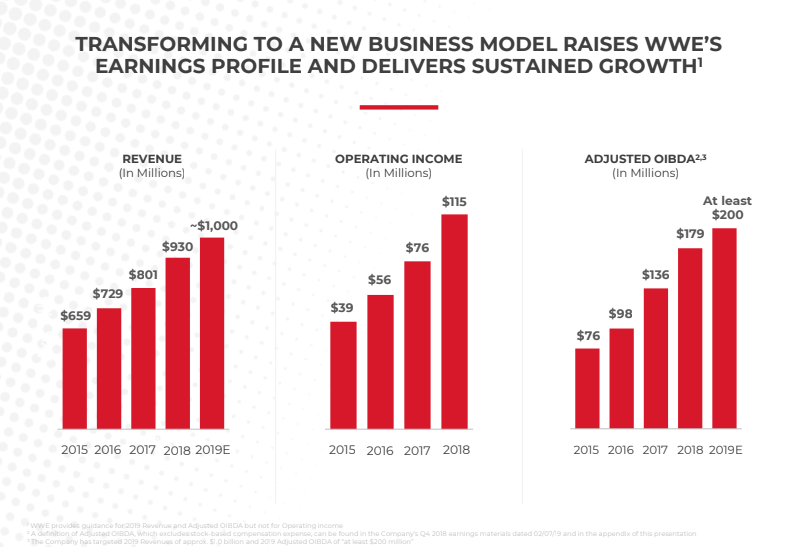 By WWE’s own estimates, revenue, operating income and adjusted OIBDA will all break new company records again for 2019. The company projects “at least” $200 million in adjusted OIBDA to close the year and $115 million in operating income, while setting a revenue record of over $1 billion. Sunday’s edition of Last Week Tonight with host John Oliver gave unprecedented attention to problems with working conditions for WWE wrestlers. The organization’s wrestlers have been misclassified for many years as independent contractors when they are in fact operating as employees. The misclassification allows the increasingly profitable company to save millions while denying talent of common employee benefits like employer tax contributions, travel expenses, health insurance and retirement benefits. “With wrestlers working as independent contractors in a monopolized industry, largely free from meaningful oversight and able to be fired at any time, you wind up with an environment with huge potential for unsafe conduct,” Oliver said on the program. Against the Internal Revenue Service’s 10-point test to determine whether a worker is an employee or contractor, WWE wrestlers arguably are functioning more like employees on almost every count. The case was examined in 2005 by Jamie Sharp in an extensive article that appeared in the scholarly publication Entertainment and Sports Lawyer. A long Twitter thread was also recently posted on the @wrestlenomics Twitter account, using the Sharp article as a guide, arguing WWE wrestlers are operating as employees on 8 or 9 out of the 10 factors. How did we determine the estimate of $28.5 million? To be charitable to question of whether WWE can afford to reclassify wrestlers, the $28.5 million estimate of the additional annual cost of converting the current number of about 215 contracted talent into employees is an aggressive estimate. The actual cost may be lower. First we made an estimate on what the current average annual compensation is for WWE wrestlers: $550,000. Again, to be charitable to WWE’s situation, we err on the side of overestimating compensation rather than underestimating. There are instances in the web archive from 2011 and 2012 showing WWE posted on its corporate website that the “average full-time, main-roster WWE performer… has an average annual compensation of $550,000”. At that time, the website said, 120 performers were under contract. 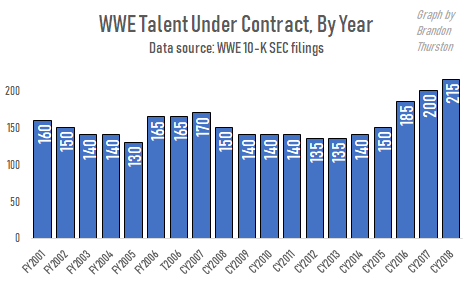 Since 2012, the number of talent under contract has increased, especially in the last few years. WWE’s 2018 annual report showed there were 215 talent under contract. In our estimate of the cost of converting contractors to employees, we’ve maintained the assumption that the average compensation is $550,000. This is an aggressive estimate, again to be charitable to the question of whether WWE can afford the conversion. The actual average compensation may be lower. The increase in the number of workers are largely from wrestlers who valued less and who are less vital to WWE. This assumption is based on facts like WWE’s expanded talent development system in recent years, the advent of the WWE Performance Center in Orlando in July 2013, the opening of the U.K. Performance Center in January 2019, the increased touring of the NXT brand and the creation of other alternative brands like 205 Live and WWE NXT UK. In other words, the majority of the newer talents under put contract are likely to be paid lower than the average worker in 2012. The addition of higher-priced talents like Ronda Rousey and Brock Lesnar would likely not increase the average annual compensation above $550,000. So we can aggressively estimate that 215 talents are being paid a total of $118 million annually. Therefore even if WWE converted all contracted talent to employees -- released no talent and didn’t reduce talent pay -- the company’s additional total payroll liability (that is, the cost of employer contributions to FICA tax, Medicare tax, unemployment tax and Connecticut state tax) would be about $3.6 million annually. Accounting instructor Omar Roubi, from the University of Colorado Denver helped determine these payroll estimates. WWE would have two options for providing health insurance to wrestlers: fully-insured or self-funded. Those with experience working in the healthcare industry who we spoke with suggested WWE would be more likely to use the self-funded option, using the company’s own funds to cover medical costs while hiring a health insurance company like United Healthcare Services, Inc. (which at least at one time covered WWE corporate employees) to administer claims and get preferred rates from healthcare providers. Many large companies in the U.S. use the self-funded method of coverage, and then engage employees on wellness and disease management/intervention to try to decrease healthcare costs. Self-funded is also more likely because WWE’s Talent Wellness Policy may come under scrutiny if the company attempted to obtain fully-insured coverage for talent. In this scenario, WWE would likely hire a consultant to design the plan, establish co-pays and deductibles, and ultimately offer multiple coverage plans to talent at various premiums. According to the Kaiser Foundation, the average annual premium per employee in the U.S. was $19,616 in 2018, with employees paying an average of $5,547 toward the cost of the plan. Obviously, compared to the average U.S. employee, given the nature of their work WWE talent would be at a higher risk of making medical claims. 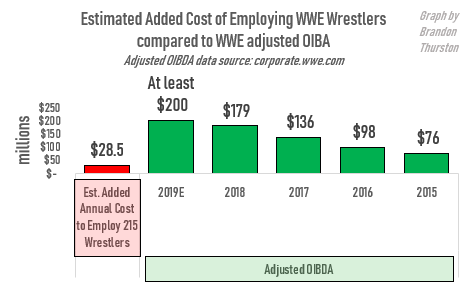 If we estimate WWE talent would cost about 30% more to cover versus the average U.S. employee, the annual cost for coverage per wrestler comes to about $25,000. So if we were to aggressively estimate that WWE took on the entire cost of premiums, without contributions from talent, for 215 wrestlers at a cost of $25,000 per wrestler, the total cost would be about $5.4 million. That cost could be higher for WWE in years with more medical issues than usual, or lower in years with fewer issues. To estimate the cost of a typical retirement plan we calculate 5% of average compensation. If average compensation is $550,000, as we aggressively estimated above, 5% of that for 215 talent comes out to just under $6 million annually. Again using the $550,000 average annual compensation assumption, if we assume that all employees chose to contribute 7% of their income to a 401k plan (double the 2010 average of 3.5%) with employer matching, that would bring WWE’s annual obligation for such a plan to $8.3 million. Employees would likely have options to contribute less than 7% or make no contribution at all, which would lower the cost of WWE’s obligation. The WWE Performance Center website currently lists 114 talent in developmental who we believe are already eligible to have their expenses covered. This leaves about 101 talent left to have travel expenses covered. Using cagematch.net’s data for WWE in 2018 as a reference, of main roster talent we count about 10,000 appearances annually out of the 16,000 appearances that need travel covered. For fuel and tolls, we estimate an average fuel cost of $2.90 per gallon, fuel efficiency of 25 miles per gallon, average driving distance of 200 miles, and average toll cost per trip of $5. 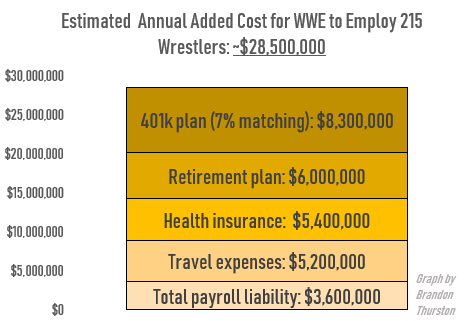 Under those factors, the total annual travel cost to WWE is therefore estimated at under $5 million. Even with aggressive estimates and even assuming a scenario where WWE cuts no talent or other costs to accommodate for the increased expenses brought on by reclassification, this is a price WWE can afford. $28.5 million annually is a price many factors below WWE’s profit margin by the measure of any profit metric. The company’s guaranteed escalating TV rights fees only further assure increased revenues and profits for the company for years to come, meaning the added expense of converting WWE talent from contractors to employees is affordable now and will only become more affordable for WWE in the years to come. Brandon has been writing about the wrestling business since 2015. He’s an independent pro wrestler, wrestling trainer, and co-host of the podcast Wrestlenomics Radio. Follow him on Twitter @BrandonThurston.